Ski = MC Squared: I'm going to Breckenridge! Round two of the 2016 PSIA-AASI National Team Selection process is complete and congratulations are in order for the dedicated, select group of ski and snowboard educators, and PSIA-AASI members who have been invited to the final on-snow interview in April, in Breckenridge, CO.
What is the PSIA-AASI Team and how are Team members chosen? Currently, the PSIA-AASI Team comprises 30 men and women selected from among the best instructors in the country. They represent the full breadth of the ski and snowboard disciplines: adaptive, alpine, alpine freestyle, cross country, telemark, and snowboard. 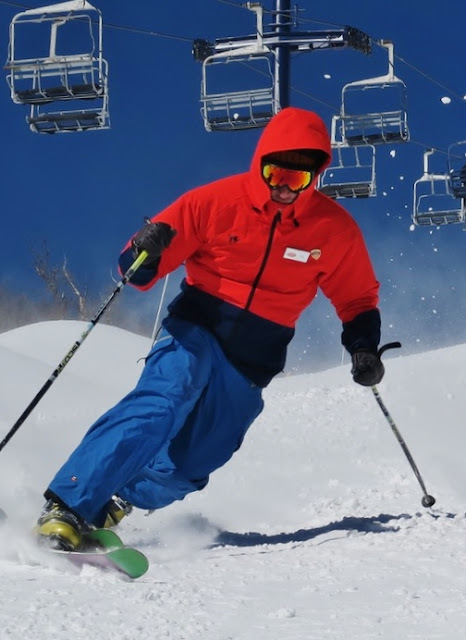 Once chosen, Team members are responsible for promoting, supporting, and assisting with the development of PSIA-AASI education programs and activities at all levels. They set the standard for U.S. snowsports instruction! There will be an on snow part, with skiing and teaching segments, and an off snow evening presentation that I'll have to prepare. I'm excited about all of it. I'm not really sure what kind of skier they're looking for, but I'm going to ski my way, teach my way, and hopefully come out of it with the greatest job in Ski Instructing. I'm stoked. So very cool. What format will the presentation take? Powerpoint or... would help if I can. Very interesting and informative blog and about the ski instructor qualification and I must appreciate your work well done keep it up. Really very interesting and very valuable information about the cursos baratos a great work.